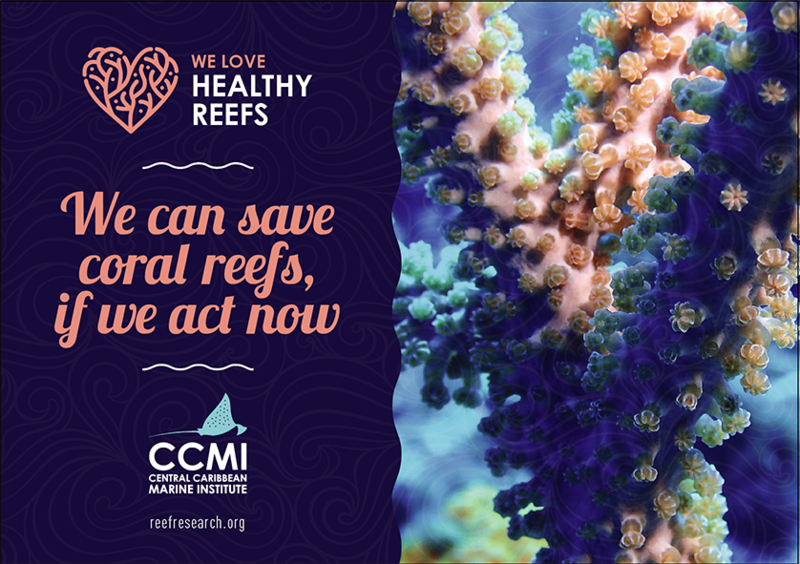 The Central Caribbean Marine Institute (CCMI) continues momentum from last year’s successful International Year of the Reef outreach efforts with their new ‘Healthy Reefs’ campaign for 2019. Throughout 2019, CCMI will work with a variety of audiences to spread the love for healthy reefs, including watersports and dive operators, students, teachers, tourists and general members of the community. Everyone can get involved in the Healthy Reef campaign and learn more about coral reefs throughout the year. CCMI has plans for a wide-reaching campaign that currently includes a public Reefs Go Live broadcast, educational posters and resources, special events and experiences, the annual Festival of Seas gala, volunteer opportunities and more. Kicking off public awareness efforts for the year is the first in the annual Reef Lecture Series: ‘Cayman Islands Reef Survey Report 1999 – 2018’, which will be held on Thursday, 28th February 2019 at the National Gallery of the Cayman Islands. In July 2018, a team of six science divers and one boat captain from the Central Caribbean Marine Institute concluded surveys of 25 reefs across the three Cayman Islands (eight reefs in each of the Sister Islands and nine on Grand Cayman), the same reefs which CCMI had originally surveyed in 1999. Using the same Atlantic & Gulf Rapid Reef Assessment (AGRRA) protocol as was used in the original 1999 survey, scientists revisited the same sites, conducting surveys to see how the reefs fared 20 years later. By comparing the two surveys, they would have an accurate assessment of the change in reef health during this time. CCMI will share recent survey results were and how those results compare to what was seen 20 years ago. The presentation will begin at 5:45 pm, and there will be an opportunity to ask questions at the end. This event is free and open to the public. Registration is requested at: http://donate.reefresearch.org/reefsurvey. The Healthy Reefs campaign and the first event of the 2019 Reef Lecture series is supported by Aureum Re, Refuel, The Darwin Initiative and the National Gallery of the Cayman Islands.